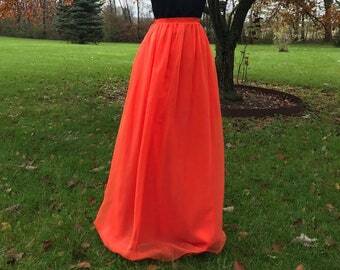 Handmade Chiffon Skirts, Tulle Skirts and more! 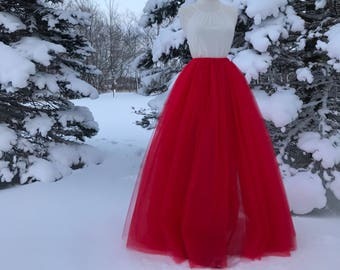 Announcement Specializing in adult tulle skirts and tutus, perfect for all occasions; bridal showers, bridal parties, bachelorette parties, engagement photos, birthday parties or everyday wear! 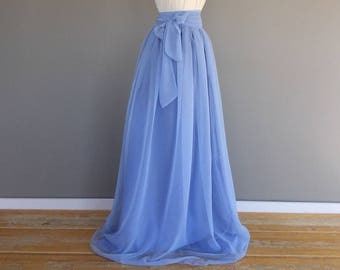 WAIST: measure your waist where you want your skirt to sit, either low, mid or high waist (I've found mid to high to be most universally flattering). 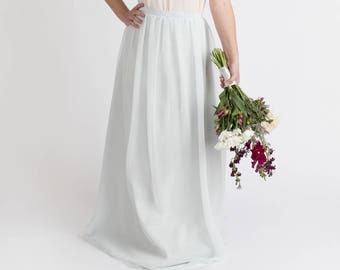 LENGTH: measure from where you take your waist measurement down your backside to be sure your skirt will provide enough coverage, if needing floor length, please take shoes into account. If wanting the puddled effect, please add extra inches! 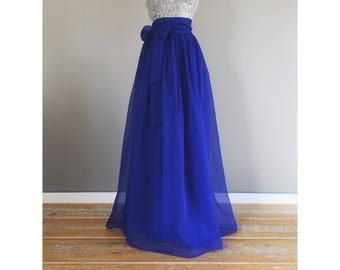 The length ordered will be the total length of the skirt. 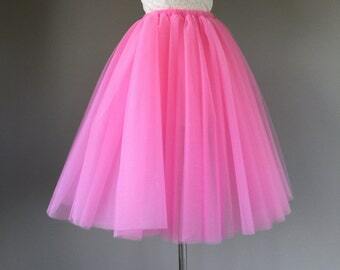 Specializing in adult tulle skirts and tutus, perfect for all occasions; bridal showers, bridal parties, bachelorette parties, engagement photos, birthday parties or everyday wear! Leider ist mein Artikel ca. 1 Woche später als geplant angekommen. Bereits im Vorraus habe ich 20 € Versandkosten nach Österreich bezahlt. Dann sind durch den Zoll nochmals knapp 30€ zusätzlich verrechnet worden. Trotz sehr sorgfältigem Abmessen ist der Rock auch zu groß. Durch die große Menge an Stoff trägt er auch ziemlich auf. Besonders enttäuschend war, dass der Stoff im Internet wesentlich hochwertiger aussah, als in der Realität. In love with this customer photo!! 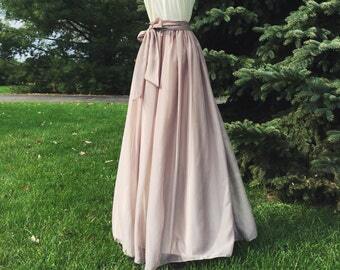 One of our most popular skirts- Swiss coffee over beige satin. Picture perfect in silver georgette! 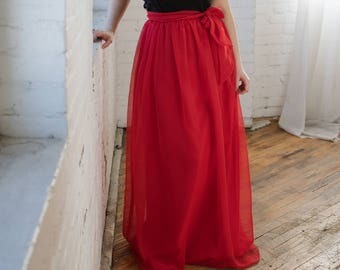 New waistband option available on all chiffon or georgette skirts upon request! Hi! Thanks for checking out my shop! My name is Victoria and sewing is my life. I am truly grateful to be doing this full-time and having the opportunity to be a small part of your happy occasions. This really is my dream job and my only regret, is that it took me so long to get started. For the majority of the last 10 years, I've spent my days as a stay at home mom, and had only sewn items for myself, family and friends. In 2014, both of our daughters were in school full-time for a couple years and my husband (and the occasional passer-by) was finally able to persuade me that my products would sell. I nervously took the leap into starting this shop and the rest is history. 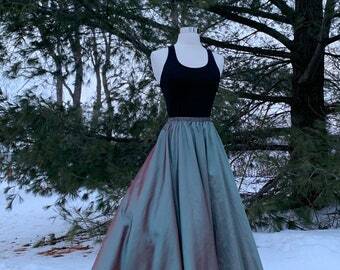 Without a doubt, my favorite part of this journey has been the feeling of excitement and gratitude I get when I recieve photos from customers, smiling on their happiest occasions, wearing my skirts and accessories. I am so thrilled to be doing what I love everyday! I describe my style as modern, fresh, colorful and feminine. Every item in this shop is handmade by me, in my home studio (smoke free/ dog friendly). I use only designer fabrics and other high quality materials. I also use a machine serger to give all my clothing a finished, professional look. I am currently focused on the clothing aspect of my shop, but will be expanding the handmade gift section soon! V. Marie is a handmade clothing and gift shop. I am inspired by all things colorful, fresh, modern and feminine. All of the items in my shop are handmade by me in my home studio. Every item is made with quality and durability in mind. 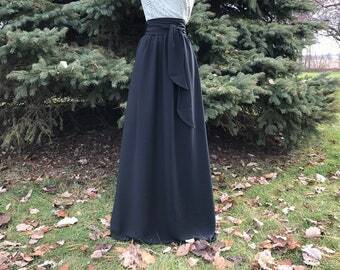 Made to order skirts: Due to the custom nature of our garments, there will be NO returns on made to order pieces. Please be sure to verify measurements before ordering. Exchanges will be accepted on a case by case basis. *****PLEASE DOUBLE CHECK MEASUREMENTS PRIOR TO ORDERING!! Any exchange made due to buyer error will also incur 25% restocking fee. Scarves and other items (not custom): Happy to exchange or accept returns if notified promptly (5 business days). Buyer is responsible for all shipping and rush fees. Rush production orders: No cancellations allowed. I will open a case with Etsy for nonpayment. Time frames on custom orders vary, please check the shop announcement for current ship times. Generally expect 4 weeks for production, unless a rush order has been arranged. Very few items are "READY TO SHIP" these items will be shipped within 1-3 business days of cleared payment. 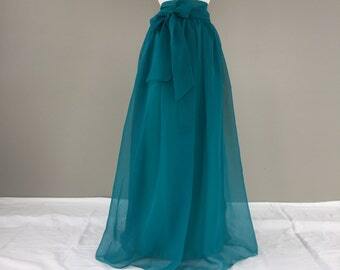 All skirts, tutus and scarves will be mailed domestically priority via USPS with tracking. Internationally either first class or priority depending on package value, size and weight. I am happy to send packages directly to gift recipients including a free personalized note from you. Note that orders are shipped only to the address listed through Etsy and not PayPal. Please note that some countries charge custom fees and other taxes in order to pick up an international package. Please be aware of your specific countries guidelines. I will not falsify information or mark an order as being a gift in order for you to avoid these fees. I am happy to offer custom orders, please convo me and we can discuss fabrics, patterns and sizing. Rush orders that are requested in a shorter time frame than my usual turnaround time will incur a rush charge. Due to differing monitor and computer color settings, the colors you see might not exactly match the actual colors of the items in my shop, though I make every attempt to photograph in natural light. Hi! Accurate measurements will ensure a perfectly fitting skirt. Please take the time to measure before packing your order. The most common mistake in taking measurements is giving a jean size, please follow the guidelines to get the perfect fit. Feel free to message if you are looking to see something specific! 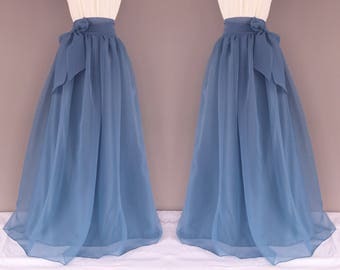 I offer two styles of tulle skirts, one with an attached satin lining and waistband and the other more popular ALL tulle with an OPTIONAL satin slip to be worn underneath. 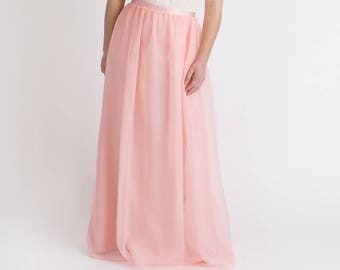 Sashes are not available for tulle skirts. 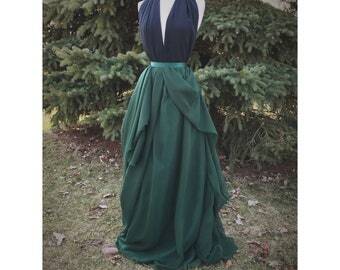 Most find a high or natural waist look to be most flattering, I recommend wearing at the smallest part of the waist. Please take the total length measurement from where the waist is taken. Don't forget to take into account shoes! 1) Please order swatches to ensure color choice appears the same in person as it does on screen. Chiffon and georgette swatches are $0.75 cents and tulle swatches are $1.25. 2) Once color choice is confirmed, please request a RESERVED listing. I will require the following information, color, material, and number of bridesmaids. 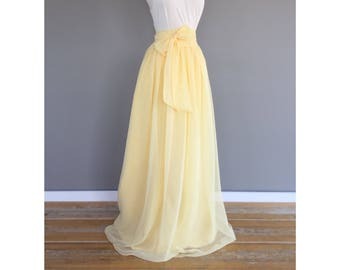 If chiffon or georgette skirts are selected I will also need to know if the sash will be required or left optional. 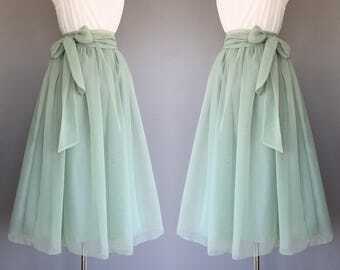 This step will drastically reduce the occurrence of someone ordering the wrong skirt.